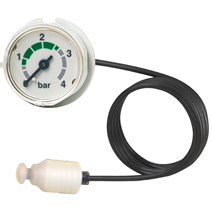 Models 101.00, 101.12 are mechanical pressure gauges with a plastic capillary. These instruments are based on the proven Bourdon tube measuring system. The plastic case is available in nominal sizes of 27 mm and 40 mm. Due to the length and flexibility of the capillary, the mounting position of the indicator can be independent of the measuring point. Through the use of a specific plastic, the long-term resistance of the capillary is also maintained at high temperatures. An advantage of plastic capillaries, as against copper capillaries, is that these do not need to be bent or coiled. Thus, the plastic capillary makes installation much easier and eliminates the risk of any fatigue fracture. These instruments are particularly suitable for application in the heating industry. The suitability of the instrument was confirmed in long-term tests under characteristic application conditions. Based on many years of experience in manufacturing and development, WIKA is also happy to offer customer-specific solutions. The G ¼ B standard process connection can, on request, also be completed with a plastic sealing ring at the thread. This eliminates the time-consuming and error-prone sealing during mounting. For customer-specific process connection designs, WIKA also offers the development of plastic plug connections to meet the requirement.